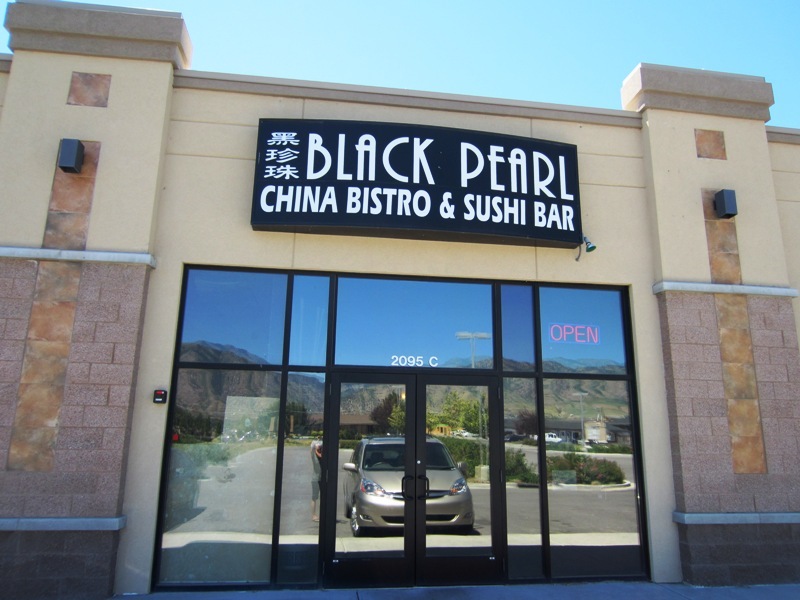 Update 6/21/2012: I've just gotten some new info about the Black Pearl Asian Bistro & Sushi in North Logan, Utah. 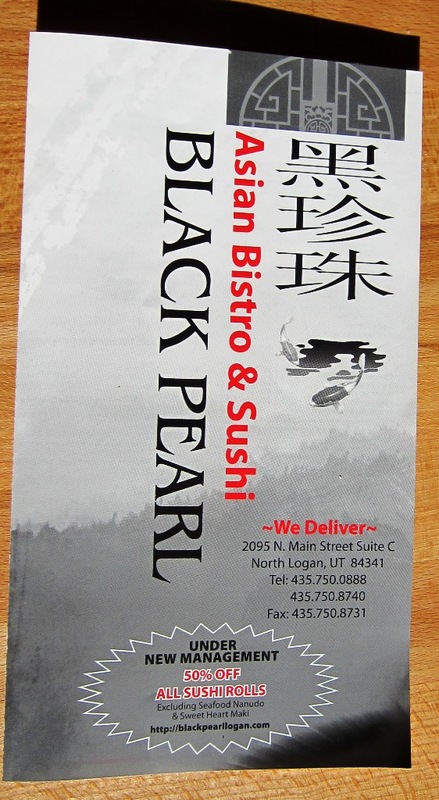 First, "Black Pearl Asian Bistro & Sushi" is the new name on the menu I picked up today, a change from Black Pearl China Bistro & Sushi Bar (which still appears on the signs). Second, Black Pearl has a website featuring their menu at blackpearllogan.com and I've also included pics of the menu below. Third, the "50% Off All Sushi Rolls" special is actually available all day every day until further notice. Fourth, delivery is available. Fifth, the restaurant is only open for dinner on Sunday. Read on for the full original review. We were pleasantly surprised by a couple of recent visits to the Black Pearl restaurant in North Logan. We had enjoyed the restaurant on our first and second visit when it opened in 2007, but then we had several mediocre and bad experiences that caused us to vow never to return. Word of new management and the announcement of a half-price sushi special enticed us to try the place again, three years after our last visit. We went for lunch with Tyson's dad and ate a lot of decent-to-good sushi that was definitely a great value. We returned last week for lunch with our kids, and I have reviewed that visit below. Hours: Monday-Thursday 11 a.m.-9:30 p.m., Friday 11 a.m.-10:30 p.m., Saturday 12 noon-10:30 p.m., Sunday 4 p.m.-9 p.m. Lunch combo: $5.95 - $8.95 11 a.m. - 3 p.m. Specials: Black Pearl currently offers a 1/2 price deal on all sushi rolls (excluding Seafood Nanudo and Sweet Heart Maki) during all business hours. At last the curse of the Black Pearl appears to be broken. After a few years of declining food quality and service, the Black Pearl has been revived and refined by new management. Chinese, Japanese, and Thai cuisine share the menu, with completely satisfactory and sometimes downright delicious results. Service can be hit or miss, as turnover in the waitstaff seems to be high. Lunch specials starting at $5.95 are a great bang for your buck and include soup, main course, rice, dumplings, and fried wantons. Sushi rolls are fresh and well-prepared, if a bit unimaginative. Here's to hoping it's smooth sailing for the Black Pearl from now on. 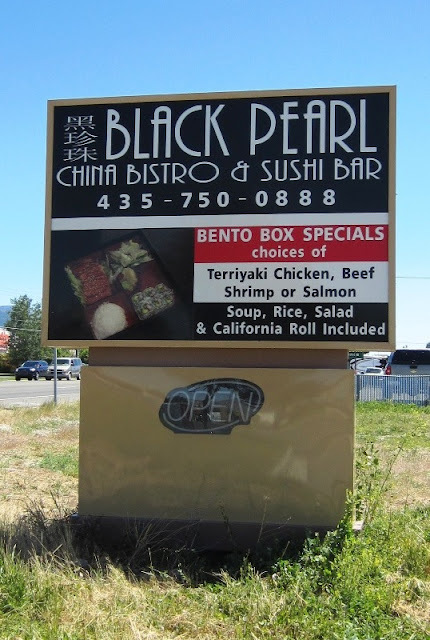 The Black Pearl China Bistro & Sushi Bar occupies a couple of units of a nondescript strip mall set back on the west side of Main Street in North Logan. The bland stucco exterior gives way to a strikingly-designed modern dining room with soaring ceilings, bamboo accents, and a rich and sedate color scheme of tans and blacks. This is one of the better looking restaurants in Logan, especially at this price point. Seating is mostly booths, with a couple of tables that can be pushed together to serve larger groups. Customers may also sit at the sushi bar along the back wall. The dining room and restrooms are clean and in good condition. Subdued lighting and interesting accents like a huge, curved "bamboo" wall give the restaurant a sophisticated ambiance. 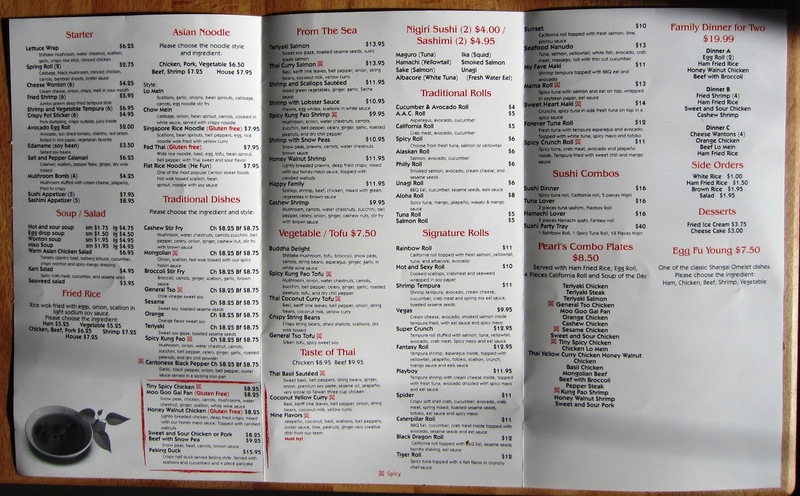 The menu includes Chinese selections, sushi and a few other Japanese items, and even a few Thai dishes. Most multi-cuisine restaurants fail at at least one (if not all) of their cuisines, but on a recent visit Black Pearl delivered at least competent and sometimes excellent selections from all three cuisines. When we arrived our friendly waitress promptly placed a plate of fried wonton strips on our table and took our drink orders. Litlle snacks like this are such a boon when one is dining with children! We started with a bowl of edamame, or salted green soybeans in the pod, because my kids love them. I believe they were $3. For our main selections we chose two lunch combo boxes and two sushi rolls, to be shared among all of us. The lunch boxes come with choice of soup, main course selected from a list of about 15 choices, side of fried rice, two fried cream cheese wontons, and two potstickers/dumplings, all for just $5.95 (add two or three dollars for shrimp selections). We chose honey walnut chicken and Thai yellow curry chicken. Our sushi roll choices were the Aloha Roll, which includes mango and a sweet sauce, and another more basic roll I can't remember the name of. They were both 1/2 off because of a weekday lunch special. The raw fish tasted clean and fresh, and the rolls were cohesive and well made. Our adventurous four-year-old son gobbled up just as many pieces as his parents did. Soup selections include miso, hot & sour, wonton, and egg drop. We ordered one wonton soup and one egg drop soup, which arrived steaming hot and perfectly adequate in taste and portion. Soon after, the lunch boxes arrived, mounded with heaping portions of food. The huge pile of honey walnut chicken (traditional American-Chinese preparation with a mayonnaise-based sauce) was piping hot and tasty, with tons of chunks of battered and fried white chicken meat kissed by a glaze of the sweet, white sauce and dotted generously with candied walnuts. For me, though, the star of the show was the Thai curry. Chunks of chicken, loads of green beans and other veggies, and plenty of Thai basil swam in a complex and spicy yellow curry sauce. I only wish I had remembered to ask for white rice rather than fried rice to accompany the curry. I can't be certain the curry base didn't come from a container (there are some good prepared curry pastes out there), but even if it did, it was prepared properly and included a bounty of fresh ingredients. The dumplings and wantons were also good. Coke and coke products are available in addition to jasmine tea, domestic and imported beers (including Tsing Tao and Sapporo), wines by the glass, and sake. Throughout our meal our server demonstrated the perfect combination of attentiveness and respect for our pace and our situation. She was kind to our children and always kept our glasses full. She cleared dishes promptly and checked back at appropriate times. We were happy to tip her generously and only wish she could stay long term at the Black Pearl. Unfortunately that would be the exception to the rule. Wait staff seems to have a high turnover rate at Black Pearl. The Black Pearl is an ideal place for a date, an outing with friends or family, a business lunch, or even a solo lunch at the sushi bar. Well-behaved children are welcomed, but the menu and restaurant are not designed with kids in mind. I'm so glad to see the Black Pearl get back on track. I may be ready to crown it Logan's best Chinese restaurant! P.S. : What has your experience been at Black Pearl? 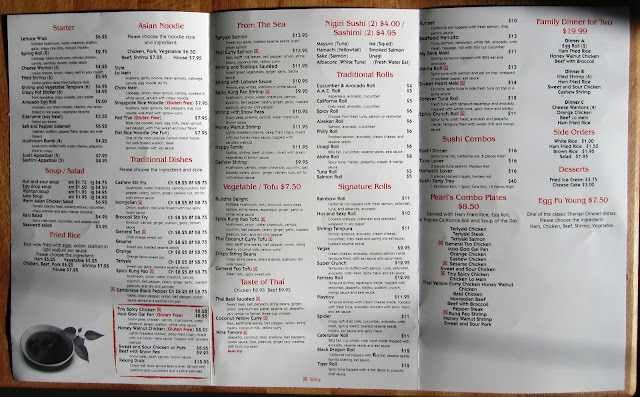 What other Chinese restaurants do you like in Logan and Cache Valley? Do you think most Chinese food kind of all tastes the same, especially at the take-out focused places? Well, did you know that all Chinese food tastes the same on the East Coast, too, but it tastes the same in a DIFFERENT way than it does here? True story! Thanks Petrice! I'm glad someone caught my reference to Pirates :) You might want to call for exact details but the 1/2 price sushi is a great deal. I think it's weekday lunches, for most of the rolls. I have seen many negative comments about Royal Express and I think that attitude is attributed to their small buffet/Smith's Chinese style of service. However if people order the food cooked fresh to order-it ROCKS!!! Thanks for the kind words and all the good info about Royal Express. It is the favorite of my brother-in-law but I've only had the steam-table food, not cooked to order. I need to go and try your recommendations. What do you like at Mandarin Garden? We used to always go there with a friend and I could take it or leave it, but it's been several years. Also, years ago Formosa was a go-to for large family dinners with my in-laws, but it just seemed to keep slipping downhill and I haven't been in five years. I want to get the same thing from all the Chinese restaurants in town and compare/contrast. I hope your Black Pearl visit works out for you. 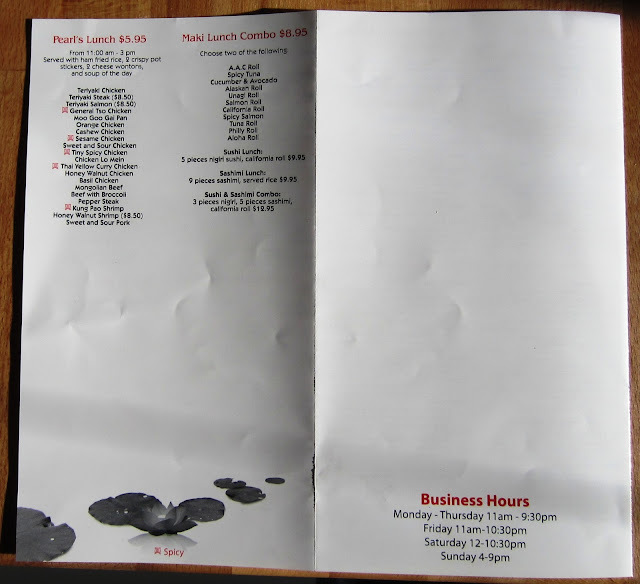 Prices are right and the things I had were good, but the menu is large so I'm not sure of quality and taste across the board. Are your products in any local stores? I have looked for you at the CVGM but maybe not on the right weeks. You are welcome! I love the Lo Mein dishes at Mandarin (with extra spice.) We tried it with beef the other day and it was really quite tasty. Another favorite is the Tangerine Beef and my husband loves the Won Ton Soup-it is always full of big chunks of veggies, meats and dumplings. It has gotten better over the past couple years, but as always service is a factor. :( I honestly prefer Royal Express to Mandarin. I am so sorry to have missed you at market! They kind of stick us in a hole when we to!! We will be there every other week for the rest of the season. Our next market is the week of the 18th. I have a demo at Whole Foods, so I won't be there, but pop in and say hello to Alycia!! Our products are in all the Lee's, Fresh Market and Cox's Honeyland. A few other small shops carry them on and off, but if you want consistency and new products, go for Lee's or Fresh Market!! Thanks!